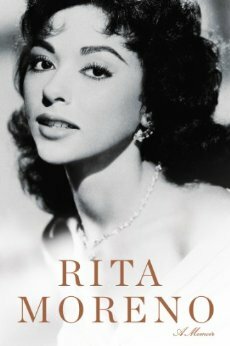 It doesn’t take long to read Rita Moreno’s new book. It’s 304 pages, but it is a real page-turner for a memoir. One reason is that her writing is expressive. Her voice comes through from cover to cover. It is consistent and it is honest as she describes her struggles and the turning points in her life and career. She is one of very few performers who have won all four of the major awards—Oscar, Tony, Emmy and Grammy. Even though she achieved recognition as a performer, she also had her share of disappointments. With vivid descriptions, she takes you from her tropical childhood home in Puerto Rico to bustling New York City where she spent her youth. She recounts her confusion and sadness at age five when her mother, who was in a bad marriage, chose to relocate to NYC and leave Rita’s small brother behind. This painful childhood memory, which affected her both as a child and adult, was threaded throughout the book, adding a measure of suspense as to whether she would be reunited with her brother. Even though she worked on some important films in Hollywood—Singin' In The Rain, The King and I and West Side Story—she was frustrated that she was frequently typecast in ethnic roles. While in Hollywood, she dated many famous men, including Howard Hughes, Marlon Brando and Elvis Presley. Her obsessive, on and off again relationship with Brando was very intense. It lasted for years and would prove to be almost fatal in the end. Soon after her break-up with Brando, she won the Academy Award for Best Supporting Actress for her role in West Side Story. It was very moving when Rita recounted how proud the Puerto Rican community in her old Bronx neighborhood was that she had won this award. Rita thought that this was her big break, but she was soon disappointed. A significant portion of the book revolves around her long, stable and loving marriage to a New York psychiatrist and their daughter. Her career, which became more varied over the years, included stage and television where her most recent role was in the sitcom Happily Divorced. It was during these happier times that she was awarded a Tony, Emmy and Grammy. At the end, of this well-written and thoughtful memoir, you feel like you know and understand Rita Moreno, the talented, determined survivor who loves performing and never gives up.